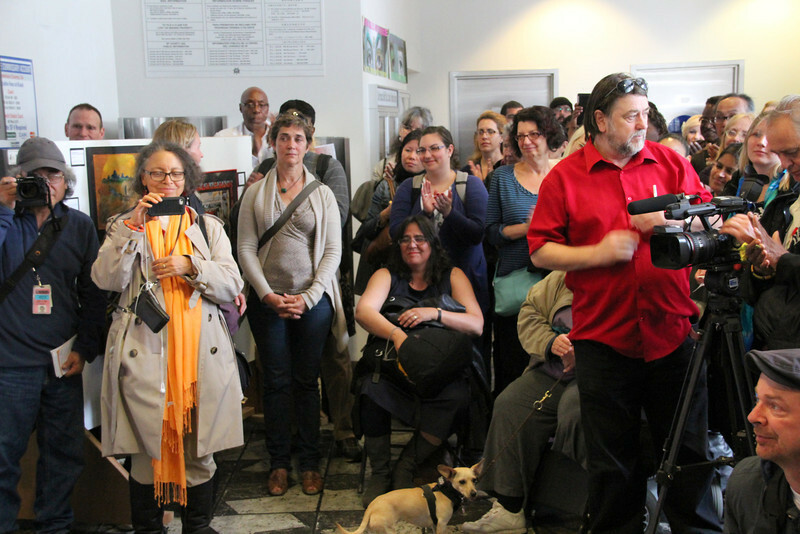 San Francisco, 3:30pm, Friday, May 10th, a first time ever Mother's Day Art event was staged in the foyer reception area of San Francisco's County Jail #2 (CJ2), a jail located on 7th Street, just around the corner from the Hall of Justice on Bryant. The event’s art show featured both performing and display art. The latter included pieces made by inmates out of paper and fabric. The performers included both former inmates and children of inmates. At the same time as the lobby event, a Mother's Day gift exchange occurred in the jail’s visiting room in which inmates exchanged homemade gifts - works of art, with their children. Sheriff Mirkarimi also announced a new in custody doula program for pregnant inmates. This was part of his efforts to improve the jail’s family based services for the currently and formally incarcerated. The performing event featured a performance by "Project What!? ", a community works program for youth who have a parent in custody. There was also a dramatic presentation by the Rising Voices theater, a troupe of formerly incarcerated young women. Not all within the San Francisco Sheriff’s Department were happy about this event, however. An inside source at the Sheriff's Department informed me that some of the deputies disapproved. For them, it was seen as being “too soft”. It certainly defied tradition. For these reasons and more, Sheriff Ross Mirkarimi showed courage and compassion in organizing this event. This was a poignant and moving event that elicited both joyful smiles and tears among the performers and the audience.